Dead Beat Is Officially Out, Please Help Support My Music! Today is officially ‘Dead Beat’ day. I can’t stress enough, that if everybody here purchases the album I will be able to start working on the next cd and film a music video or two in the meantime. The fate of this project is in your hands. If you want to continue to hear new Rufus Rex music, please help support it today by purchasing an album directly from my website. Or any or your other favorite digital stores! Please help spread the madness and tell all your friends about Rufus Rex. Check Out The Brand New Rufus Rex Single ‘Dead Air’! As we move closer to the release date of my album Dead Beat, I wanted to released another song from. This one is called ‘Dead Air’ and it’s a bit of a departure from the last three singles, but I wanted to write a radio song for the end of the world. Please check out the song on my official Rufus Rex SoundCloud page and follow me there so you can check out the new songs as they are posted. I can’t stress enough that If you like what you’ve heard so far, please support this project. If everybody here purchase the album from my website today, I’ll be able to start work on the next one. The fate of this project is in your hands. Pre-Order your Copy Of My Debut Rufus Rex Album Today! Such safety finds us trembling lambs environed by wolves, the time has arrived and DEAD BEAT finally rises. My debut album from my solo project Rufus Rex is finally complete and ready to be unleashed onto an unsuspecting world. The album is a concept about one man’s quest for immorality and the strange world he discovers after awakening a terrible evil older the time itself. It was a story I was trying to turn into a horror screenplay some years back, but it just wasn’t working, so I decided to try it in album form. In the meantime, I also adapted it into comic book form, so if all goes well, you’ll be seeing the DEAD COMIC book sometime early next year. The official release date of DEAD BEAT is October 11th, but you can pre-order it today using the Paypal links below or through snail mail. All pre-orders will ship out the first week of October, so you can get it into your Halloween playlists well ahead of schedule. I’ve spent the last two years stealing fragments of time to make this album and I’ll be releasing it entirely independent through my newly formed Villains And Vaudevillians record label. This means the I will not be releasing it in stores, you’ll only be able to purchase the physical copies from me directly and then It will be on all the online digital services (Itunes, Amazon, Etc) by the release date of October 11th. If you like what you hear so far from this project, please help support my music and purchase the album directly from me. I have put all of my stone-encased heart, blackened soul, and money into this album and you guys hold its fate in your hands. All proceeds from this album go towards the recording of the next Rufus Rex album and coffee to keep me awake through the whole process. If you are one of those people who doesn’t buy music or if you would like to help out and see more music from Rufus Rex and my various other strange projects, I have a donation button set up below. I work far removed from the system so any size donation helps immensely. And last, but not least, here is a brand new single to tide you over until October 11th. It’s entitled From The Dust Returned A Titan and it describes the impending sense of doom as the world shudders in the arrival of the beast that no longer sleeps. Enjoy another twisted taste of DEAD BEAT. While you’re at it, please revisit my first two singles. Please help spread the word by sending those two Youtube lyric videos to your friends or pointing them towards the official Rufus Rex Bandcamp page where they can download them for free and send them to their friends, and so on, and so on. I wanted to thank everybody for all their ongoing support and with your help there will be a ton of new stuff coming your way in the months to come. Next up is the new CREATURE FEATURE album, I’ll be releasing the album name, cover artwork, and new single in the next few weeks. DEAD BEAT Rises! Pre-Order your Copy Of My Debut Rufus Rex Album Today! 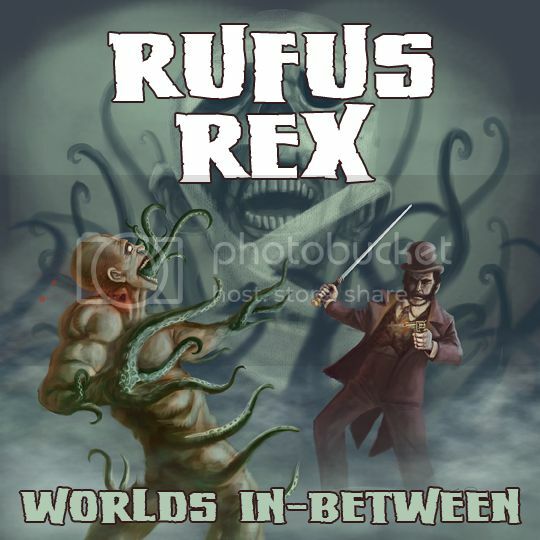 Check Out The Brand New Rufus Rex Single Worlds In-Between! It’s been a long time coming, but I finally put the finishing touches on my Rufus Rex album DEAD BEAT. You’ve already heard the first single Rise Lazarus Rise and I just released the next single entitled Worlds In-Between on my official Bandcamp page. The album is a concept about one man’s quest for immorality and the strange world he discovers after awakening a terrible evil. Here is the single cover artwork depicting the hero battling one of the unnameable creatures from the worlds in-between let loose by his meddling with the powers that be. Artwork by none other than Thomas Boatwright. Just like my previous single, I released Worlds In-Between on my Bandcamp page offering it as a ‘Pay What You Can’ option. I am releasing this album independently on my Villains And Vaudevillians record label and I really need your help to do so. If everybody here purchases the song for just a dollar or makes a donation of any amount, I will finally be able to release this album properly before Halloween for all to enjoy. If you really can’t afford it, then by all means download it for free, I’d rather you have the music than not. If you can afford to support this project by either purchasing the song for a dollar or by making a donation of any size, then please do so and if all goes well, I’ll be able to get this album out by September. With your help I’ll finally be able to awaken this long slumbering project and finally release it the way it’s supposed to be. Click the single artwork or the banner above to be magically whisked away to the official Rufus Rex Bandcamp page. Also, if you feel so inclined, please help me spread the word by telling all your friends about the song and where they can get their copy. If you have the time, review it, talk about it, repost it on your Facebook, Twitter, Tumblr, Myspace, personal blog, forums, or any other website you use to keep in touch with your friends online. I also posted a lyric video up on my Youtube page incase you want to know the lyrics. Brand New Rufus Rex Single: WORLDS IN-BETWEEN Coming Tomorrow! 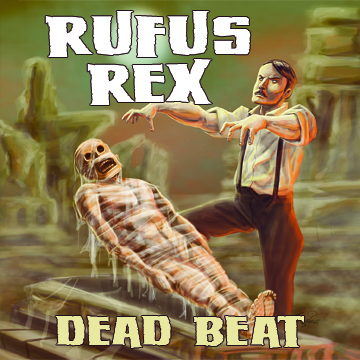 It’s been a long time coming, but I finally put the finishing touches on my Rufus Rex album DEAD BEAT. You’ve already heard the first single Rise Lazarus Rise and tomorrow at noon (PT) I will be releasing the next single entitled Worlds In-Between. The album is a concept about one man’s quest for immorality and the strange world he discovers after awakening a terrible evil. 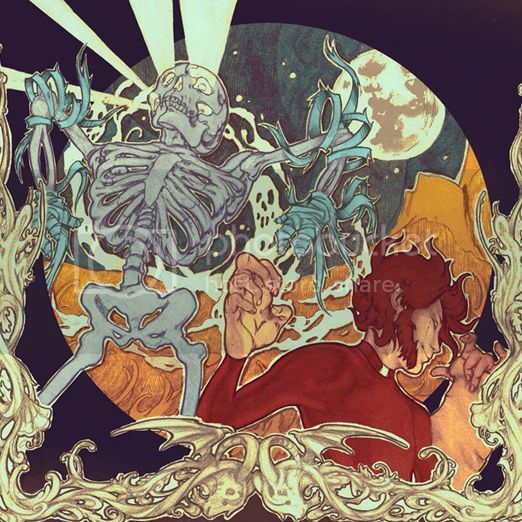 Here is the single cover artwork depicting the hero battling one of the unnameable creatures from the worlds in-between let loose by his meddling with the powers that be. Artwork by none other than Thomas Boatwright. Just like my previous single, I will be releasing Worlds In-Between on my Bandcamp page and offering it as a ‘Pay What You Can’ option. I am releasing this album independently on my Villains And Vaudevillians record label and I really need your help to do so. If everybody here purchases the song for just a dollar or makes a donation of any amount, I will finally be able to release this album properly before Halloween for all to enjoy. If you really can’t afford it, then by all means download it for free, I’d rather you have the music than not. If you can afford to support this project by either purchasing the song for a dollar or by making a donation of any size, then please do so and if all goes well, I’ll be able to get this album out by September. With your help I’ll finally be able to awaken this long slumbering project and finally release it the way it’s supposed to be. Thanks so much to everybody who participated in my contest and diligently worked their fingers to the bone. There were so many ghoulish pieces that I had a terrible time trying to pick a winner because all of the entries were so great, but unfortunately I do have to pick only one. So without further adieu, the winner is…. Fear not, I have a few ideas to incorporate a lot of the other entries here in future releases, quite possibly adding a collage in the vinyl version of the album or reprints of the cd. I will have more info on the full Rufus Rex ‘Dead Beat’ album in the next few weeks, along with the release date for my second single. Thanks again everybody and If you promise to keep listening, I promise to keep making my ghoulish music. The Rufus Rex Album Art Contest (Ends May 13th At 5:PM)! 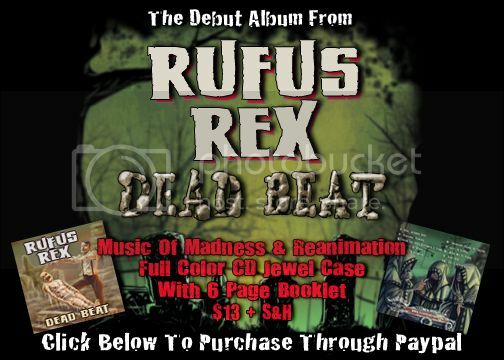 Do you want your artwork to be in the CD booklet of my upcoming Rufus Rex album ‘Dead Beat’? Well, you’re in luck. All you have to do is create a piece of artwork (drawing, painting, etc) based on the first single ‘Rise Lazarus Rise’ and e-mail it to me at rufusrexmusic@gmail.com. I will then re-post each and every entry on the website here in three places (by clicking on the title of this blog, the little sidebar to your right, and in the media section under photos) for all to see. All entries must be received by May 13th (Friday the 13th) By 5:00pm (pacific time) and I will pick the winner exactly one hour later at 6:00pm. The lucky winner will then go on to have their artwork printed up in the CD booklet of my debut Rufus Rex album entitled ‘Dead Beat’. I only have three rules, make it based on the theme of ‘Rise Lazarus Rise’, the art must be perfectly square to be able to fit the measurements of the booklet, & the winner must have a high resolution version of the artwork (at least 300dpi) ready to send upon notification. You can send as many entries as you’d like. Good luck and I can’t wait to see what ghoulish things you guys come up with. Download Your Free Copy Of ‘Rise Lazarus Rise’ Today! If you head on over to my official Rufus Rex Bandcamp page I have the first single ‘Rise Lazarus Rise’ set up so you can download it for free by entering zero in the name your price box or you can pay what you think that song is worth to you. All donations will be put toward the first Rufus Rex music video and the full album release. I have recently started my own record label under the ‘Villains And Vaudevillians’ banner and I will be releasing the album ‘Dead Beat’ independently, which means anything helps. Please help me spread the word by telling all your friends about the song and where they can get their copy. If you have the time, review it, talk about it, repost it on your Facebook, Twitter, Tumblr, Myspace, personal blog, forums, or any other website you use to keep in touch with your friends online. 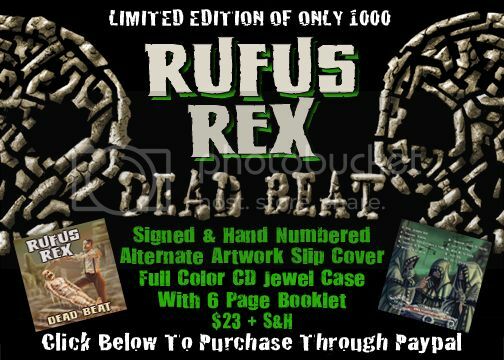 Also, check back later tonight for the first Rufus Rex contest where you could get your artwork in the CD booklet of the upcoming ‘Dead Beat’ album. Click the banner below to head on over to my Bandcamp page and download your copy of ‘Rise Lazarus Rise’ today. If you have the time, please click the banner below to check out my official Rufus Rex Facebook page and click the like button to help me reanimate the dead! I also have a lyric video posted over on my Youtube page if you want to sing along and help me bring life back to the dead. 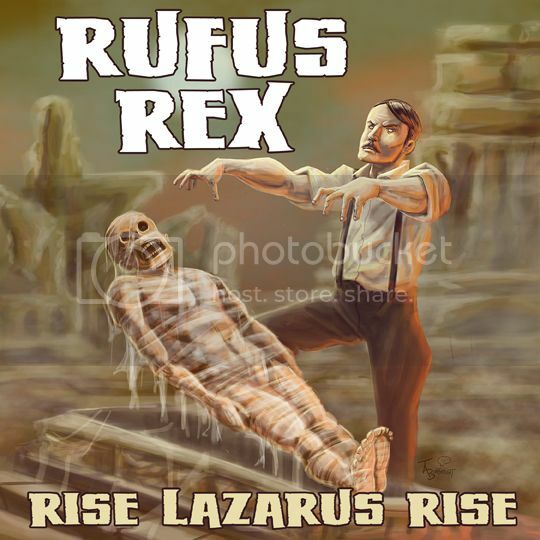 Check out the first Rufus Rex single ‘Rise Lazarus Rise’ over at Fearnet.com right now! As a special treat for all your ongoing support and to tide you over between Creature Feature releases, my friends at Fearnet.com are now streaming my new single ‘Rise Lazarus Rise’ from my new side project Rufus Rex, a whole day before I release it as a free download on Tuesday (4/19/11) at noon pacific time. Head over and sink your teeth into the first taste of Rufus Rex. While you’re there, please leave a comment and let them know what you think of the song and the exclusive premiere. Remember to check back at www.rufusrex.com on Tuesday for the free download. To quench your thirst for blood, here’s the single artwork for ‘Rise Lazarus Rise’ by the amazing Thomas Boatwright. 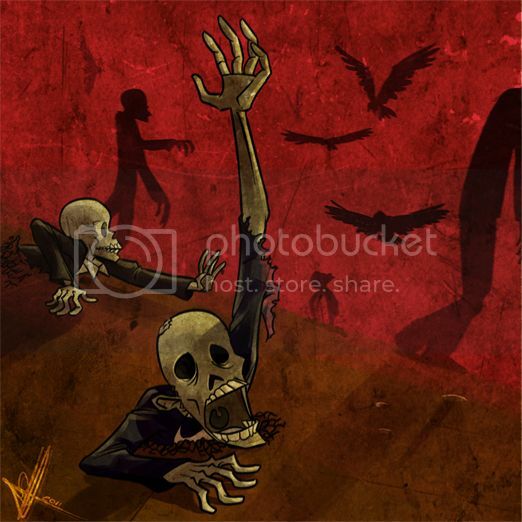 Click the artwork below to be magically whisked away to Fearnet.com where you can stream ‘Rise Lazarus Rise’ today.